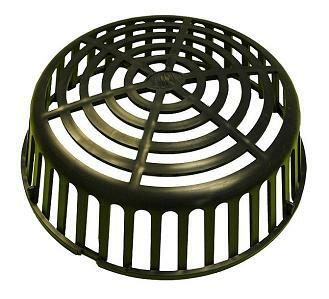 PRODUCT: ZURN Z100 REPLACEMENT POLY DRAIN DOME / STRAINER. 12.5" OD FITS Z100 15 INCH DRAINS AND SOME OTHERS. PRICE/EACH. APPLICATION: Fits Zurn Z100 15" Drains. Strainer dimension is 12.5" OD x 4-1/2" HIGH. 12.5 inch OD X 4.5 inch High Cast Iron Replacement Drain Dome, epoxy coated. (aka Zurn #29378 Z100). Price/Each. ZURN CAST IRON LOCKDOWN LUG / DRAIN CLAMPS, COMPLETE WITH SECURING BOLTS. 4 LUGS/SET. PRICE/SET.